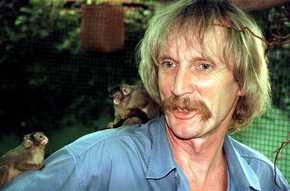 Dutch scientist Marc van Roosmalen is seen in the state of Amazonia, Brazil, in this Nov. 1997, file photo. Van Roosmalen, who has discovered more new monkey species in Brazil in the past decade than anyone else, was sentenced to more than 15 years in prison for illegally trying to auction off the names of monkey species and keeping monkeys at his house without authorization. Dutch scientist Marc van Roosmalen's success at combing the Amazon for new monkey species has earned him international acclaim and recognition as one of the world's leading biologists. Time magazine named him one of its "Heroes for the Planet." Now his work has earned him a more troubling distinction: a nearly 16-year prison sentence. He was jailed in June for nearly two months before a panel of judges freed him on bail Tuesday while he appeals. Van Roosmalen was convicted of holding an Internet auction for the naming rights of two monkey species he discovered. He planned to use the proceeds to help preserve their habitats. But the court ruled the auction was illegal because van Roosmalen was working at Brazil's National Institute for Amazon Research at the time of the discoveries and said the naming rights belonged to the government. Van Roosmalen blames the state's powerful logging interests and overzealous environmental regulators for orchestrating his conviction and accuses them of trying to discourage scientific investigation. "They are criminalizing science," van Roosmalen told The Associated Press in a telephone interview this week from the Amazon city of Manaus. Scientists have rallied around van Roosmalen, saying the case highlights a growing conflict between scientific research and Brazil's efforts to protect the Amazon with some of the world's toughest environmental laws. "Dr. van Roosmalen's situation is indicative of a trend of governmental repression of scientists in Brazil," read a letter signed by nearly 300 international scientists at an Association for Tropical Biology and Conservation meeting in Mexico. Some also suggest van Roosmalen - who sent monkey samples abroad for DNA analysis - may be a victim of widespread fears that scientists are conspiring to patent the valuable genetic information Brazil considers to be its national heritage. Van Roosmalen also was convicted of keeping wild animals at his home without authorization, and selling a scaffolding that had been donated to the institute. His lawyer, David Neves, calls the charges baseless and the sentence disproportionate. "The sentence was very stiff, it's not normal," Neves said. Prosecutors countered that Roosmalen's conviction sets an important example. "Brazil isn't against science, but there is a code of ethics that exists," said an assistant to federal prosecutor Edmilson da Costa Barreiros Jr. "Science doesn't justify the seriousness of these crimes." Van Roosmalen said he was thrown in jail without warning on June 15, after a sentencing hearing that neither he nor his lawyer attended. "I spent six weeks in prison being threatened. I have some very powerful enemies," van Roosmalen said, alluding to logging and ranching interests in Amazonas state that he believes pressed for the charges. Van Roosmalen did not explain how he made those enemies, but many of his discoveries were made in a region near the Madeira and Aripuana rivers where logging is increasing. His discovery of new species and plan to preserve habitat have the potential to make logging more difficult. Federal prosecutors said if van Roosmalen believes he is being threatened or framed, he should file a formal complaint and they would be happy to investigate. Many scientists say Brazil's regulations often hamper legitimate research, even as loggers and ranchers escape punishment for routinely ignoring environmental regulations. At 60, van Roosmalen cuts a maverick figure, with long blond hair and a penchant for wearing shirts opened to the waist. The scientist, who is a naturalized Brazilian, has published scientific descriptions of five new monkey species, a new porcupine and a new peccary species, and says he has discovered about 20 additional monkey and other animal species. "I think my father felt that if he followed all the necessary requirements, he'd never get anything done," Vasco van Roosmalen, the scientist's son, told The Associated Press. "He had the attitude that if he was doing the right thing, the rules were not important. That can get you into trouble in Brazil." Van Roosmalen's lawyer said officials from Brazil's environmental protection agency, Ibama, seemed to have no problem with his client keeping monkeys at home in the past, and even brought him sick or orphaned monkeys. Henrique Pereira, the Ibama chief of Amazonas state, said officials may have brought monkeys to van Roosmalen between 1996 and 2001, when his request to house wild animals was being considered, but stopped once the permit was denied and van Roosmalen was obliged to remove the monkeys. Prosecutors also noted that van Roosmalen was fired from a government research institute for sending genetic material abroad, among other irregularities. Congressman Jose Sarney Filho, a former environmental minister who led a commission investigating bio-piracy, said van Roosmalen was singled out as an outsider in a region rife with rumors that developed nations want to control the Amazon and its natural diversity. "I think he's being made a scapegoat, but he gave them reason to go after him," said Sarney. "My impression was he was a disorganized scientist. You could do what he did without meaning any harm."